On a Sunny but cold Saturday Afternoon in August, the Ballarat Chess Club arrived at the Geelong Chess Club rooms for the Inaugural Fletcher-Morrow Shield Match. The Fletcher-Morrow Shield is named after two significant figures in the first Chess Match played between Ballarat and Geelong in 1925. J. C. Fletcher was then President of the Ballarat Chess Club; and H. G. Morrow, President of the Mechanics Institute (which included the Geelong Chess Club). Ballarat defeated Geelong 12 games to 5 in that Match. Having been defeated in 2012, Geelong had high hopes of settling the score in 2013. Playing time was set at 90 minutes plus 30 seconds per move, with play starting at 1:30pm. Board 1 saw an early draw, after Patrick Cook successfully neutralised Michael Sugrue’s rather passive rendition of the English Opening. Board 2 was more dramatic, a Gruenfeld Defense with Bas Van Riel pressuring Geoffrey Gill’s King after the latter had secured two minor pieces for a rook. After some tense manoeuvres Geoffrey found sufficient counterplay to hold the draw. 36 g4! fxg4 37 Rxh5+! 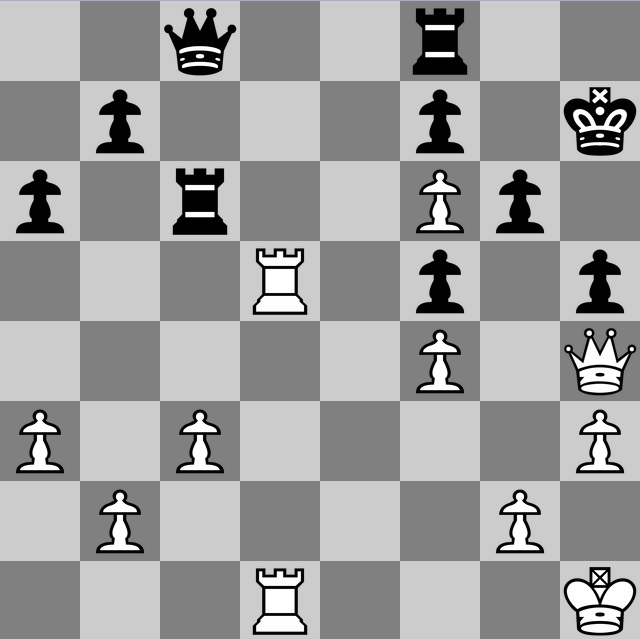 gxh5 38 Qxh5+ and Black Resigned. Board 4 saw Rob Loveband strike back for Ballarat, with a Python-like grip against Reza Daneshvar, finally breaking through on the Queen Side. Michael Severin ground out a tough win for Geelong on Board 5 against J. Brotheridge, who fought hard despite being a pawn down in a passive position. Board 7 saw Mio Ristic gain an early advantage in space against V. Rani, who struck back and gained a win for Ballarat. Joe Bakhmoutski, a new talent for Geelong, likewise struck early on Board 8, winning a pawn against T. Oppenheim, before Oppenheim crashed through with another win for Ballarat. Kelvin Lui impressed on Board 9, as the only junior pitted against a senior player. Kelvin showed maturity beyond his years in patiently winning first a pawn, then the exchange, then a piece to win for Geelong. Likewise Oliver Soo showed patience and determination to grind out a win for Geelong on Board 10, after S. Jacobs, his Ballarat opponent, overlooked a discovered attack. The last game to finish was on board 6, which was a see-sawing struggle between Bill Stokie and Rodney Jacobs. By this time, Geelong was leading Ballarat, 5 to 4. Having come back from a pawn down, Bill now had Rodney’s rook pinned to his king, and looked set to take the match. But Rodney showed great resilience in pursuing Bill’s king across the board, and forcing an ending where his superior pawn structure ensured the victory. Final Score – a Draw, with Geelong and Ballarat both scoring 4 wins and two draws.